A Little Bit etc. : Checking Items Off My Skincare Wish List + A HUGE Skincare Giveaway ($500 value)!! Checking Items Off My Skincare Wish List + A HUGE Skincare Giveaway ($500 value)!! I love checking this off a list - any list for that matter and getting to check items off my beauty wish list may be the best of all! Recently Skinstore reached out to me to collaborate and offered to have me pick a few things from their site of my choosing to test out and review. Frankly, I was like a kid in a candy store at first, but then got a bit more methodical about my approach and decided to head to my beauty wish list and use this opportunity as a chance to finally test some of the things on it. While Skinstore does carry a ton of the brands that are found on my normal shopping sites like Sephora and Nordstrom, they also have a wide variety of products from the cosmeceuticals and dermatological categories. So that is the route I decided to go. I have been asked many times over the years to delve into some of these brands, and can finally give my thoughts on a few of the brands that have interested me the most over the years. I settled on 5 products to review choosing a few things from different categories. The Skinceuticals LHA Cleansing Gel for problematic skin has been on my radar for yearsssss so that was a must try for me. 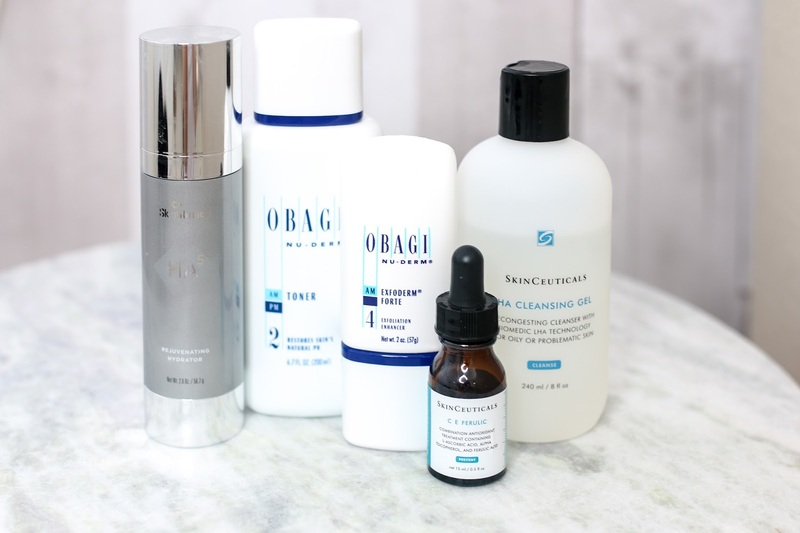 In addition to that, I tested the Skinceuticals CE Ferulic Serum, the Obagi Nu-Derm Toner (spoiler alert - this stuff is AH-MAY-ZING! ), the Obagi Exfoderm Forte and the Skinmedica HA5. I give a full review of each product in the video below as well as 5 other great skincare recommendations from the Skinstore site. Skinstore was also generous enough to send me an additional set of ALL 5 products to use for a giveaway so be sure to enter on the YouTube video here. Disclosure: Thanks to Skinstore.com for sponsoring this video and gifting me the 5 products to review and the additional 5 to give away. I appreciate that they gave me full freedom to choose the products I was interested in reviewing. This video contains my genuine recommendations and opinions.